This simple dish combines quinoa with puy lentils. The seeds of the quinoa plant have been eaten for thousands of year by the inhabitants of the Andes who highly value it's nutritional qualities. It is high in protein, fiber and iron and also has a low glycemic index. Quinoa can be purchased in some supermarkets and most health food shops. I find it cheaper to buy online; check our Where to buy quinoa page. Add the lentils to a pan of boiling enough water so they are well covered. Put a lid on the pan, turn the heat down and allow them to simmer for 15 minutes. Whilst the lentils are cooking chop the onion into small squares and fry on a low heat in a small amount of olive oil. 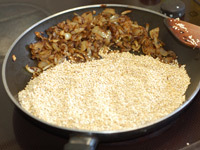 When the onions are well browned push them to one side and add a little more oil to fry the quinoa. 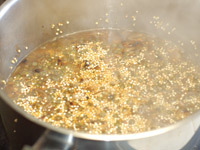 After a few minutes of frying the quinoa will darken slightly and begin to pop. Drain the lentils and put them together in a saucepan. 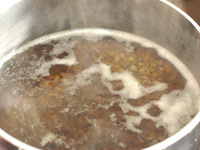 Fill the pan with water until the contents are covered then add an extra ½ an inch of boiling water. This should be about 400ml/¾ pint water. Add the stock/bouillon, cover the pan and leave it on a hob at a very low heat for 15 minutes. Resist the temptation to look at it whilst it's cooking as removing the lid will let the steam out that is cooking the food. Once cooked serve with salad and a little yogurt.